Portions of Kiawah Island have changed little in the centuries since the Kiawah Indians lived there. Indeed, preserving the island's natural beauty has been a prime concern among its various owners, from the Lords Proprietors of the Carolinas in the 1600s to Kiawah Development Partners today. May 2006 marked 30 years since the development was first announced and, in that time, Kiawah has evolved from a privately owned enclave to one of the most prized resort destinations in the United States. Ten miles long and a mile wide, with marsh and rivers on one side and the Atlantic Ocean guarding the other, the original developers recognized that Kiawah's natural beauty would play a major role in attracting visitors and home-owners. They laid out a plan that would ensure the island would not be overdeveloped, and in doing so they preserved its beauty while establishing its air of exclusivity. The island first gained international notoriety in 1974, when it was purchased from private owners by The Kiawah Island Company, a group of Kuwaiti investors who knew they could make the name Kiawah synonymous with exclusive resort living. Located just 21 miles south of Charleston, it didn't take long for that reputation to take hold. "A home that stands out among the other multi-million-dollar homes is a testament to the past: the historic mansion of the Vanderhorst family, which owned Kiawah for 200 years." As part of the overall design of the island, homes blend seamlessly into Kiawah's natural surroundings. Changing the natural topography of a property is prohibited, and strict building codes are enforced. All plans must be approved by the Kiawah Architectural Review Board, which calls its standards and guidelines "designing with nature." "We require limited vegetation removal during construction and have standards for replacement of vegetation that is disturbed," says the ARB's Amanda Mole. "With less impact to the home site, there is less perceived density. In addition, property is platted so that major trees and topogra�phy can more easily be preserved." The ARB is part of Kiawah Development Partners, which works with the town of Kiawah to maintain standards. 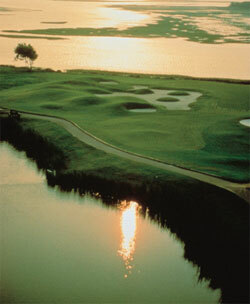 KDP bought the island from Kiawah Island Company in 1988, the same year the town was incorporated. Town and company entered into a formal agreement in 1994 that gave the town responsibility for monitoring the Island's diverse wildlife population. As a result, the city's staff includes a full-time wildlife biologist. 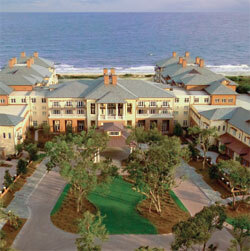 Another important island entity is the Kiawah Island Resort. Three decades ago, it and Kiawah Island Real Estate both were owned by the Kiawah Island Company. They have since separated, though they still work together closely. Both maintain an air of privacy when it comes to facts and figures surrounding clients and residents. In fact, they won't even discuss who is among the notables who own property or vacation on Kiawah. The only information Kiawah Real Estate's Theresa Martin would share is that 80 percent of the homes on Kiawah are second homes, with most owners coming from the Northeast. The rest are primary residences. Kiawah Island's three newest communities are The Settlement, The Preserve and Cassique. Two new neighborhoods, Ocean Palms and Maritime, are in the works and are now pre-selling. The Settlement is appropriately named in honor of the first English settlement on Kiawah, established in the late 1600s near the site of the current River Course clubhouse. There are plans for 120 to 130 home sites in this area, located behind the gate of a Tom Fazio-designed golf course. Residents are within walking distance of the private golf, tennis, dining and spa facilities. The homes are set far enough back to keep them from encroaching on the course. 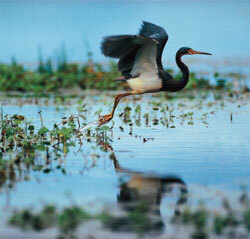 Kiawah's natural environment is especially highlighted in the community known as The Preserve. On the northeastern tip of the island, it is accentuated by a series of five parallel "fingers" surrounded by scenic salt marsh, tidal creeks and the Kiawah River. The peninsulas were divided into three zones-one for preservation, one for conservation and one for carefully buffered development. Here 150 to 175 home sites connect nature trails to an observation tower at the tip of Blue Heron Pond and to a central boathouse pavilion and dock along Cinder Creek. The gated community of Cassique sits on the western end of the Kiawah River. Relatively new to development, only 49 of a planned 200 to 275 lots have been sold. Cassique, named after a Kiawah chief, is the setting for Tom Watson's first solo course design in North America. It offers homeowners the use of a distinctive clubhouse and gardens, as well as a sports pavilion that features a family-oriented pool complex, tennis and squash courts and a state-of-the-art fitness facility. Residents of all Kiawah communities can take full advantage of all recreational facilities on the resort side, which include five golf courses, two tennis clubs, 30 miles of bike trails and a 21-acre park that offers canoeing and nature trails. A home that stands out among the other multi-million-dollar homes is a testament to the past: the historic mansion of the Vanderhorst family, which owned Kiawah for 200 years. Located almost at the island's center, the stately structure on the Kiawah River has seen the evolution of the island and even was occupied for a time during the Civil War by Union soldiers. The house was abandoned for most of the 20th century but in the last decade was fully restored under the guidance of descendants of the Vanderhorsts. They now use the home as a family country house. "The island has been developed in a correct manner," says The Resort's Owen. "About one third of the island's 10,000 acres is zoned for resort usage. But as far as expanding physical elements of the resort, there are no plans. However, we're always upgrading." The incomparable facility opened its doors in 2004 and has set a standard which is hard to meet and, according to many, impossible to surpass. Despite its 255 rooms, it maintains a mostly residential atmosphere. Its spa offers nature-based treatments and has consistently been ranked among the best in the world. Resort guests can play Kiawah's critically acclaimed Ocean Course, which hosted the 1991 Ryder Cup and will also be the site of the Senior PGA Championship in 2007 and the PGA Championship in 2012. A new clubhouse is slated for completion in Spring 2007, part of the ongoing commitment by Virginia Investment Trust to make Kiawah not just the finest resort in the United States but also in the world. Virginia Investment bought the Resort in 1993 and has committed more than $25 million to renovating all five golf courses and renovating or rebuilding each clubhouse. Again maintaining an air of privacy, The Resort's Owen refuses to discuss occupancy figures. He attributes part of the island's popularity to the fact that, even at capacity, Kiawah has been developed so there is no appearance of being crowded. But he proudly maintains that other factors fuel Kiawah's renown.